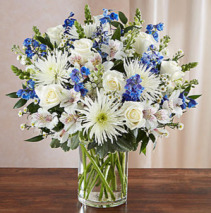 This truly original remembrance bouquet sends your condolences with elegance and grace. 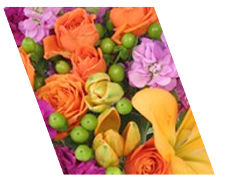 Our florists gather the freshest roses, snapdragons, yarrow, carnations and more in a glass vase to offer comfort at the home or memorial service. 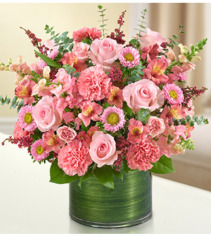 Lovely pastel-toned arrangement of roses, snapdragons, yarrow, spider mums, stock, carnations, mini carnations and monte casino, gathered with variegated pittosporum. Memories are timeless treasures of the heart, meant to be cherished. Our striking, all-white sympathy arrangement of roses, snapdragons, alstroemeria and more, elegantly designed by hand in a graceful cylinder vase, is a touching tribute to a life well lived and the memories that will be held dear forever. 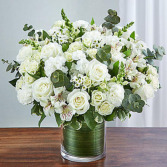 Fresh arrangement of white roses, spray roses, snapdragons, alstroemeria, carnations, mini carnations, and monte casino, gathered with variegated pittosporum and spiral eucalyptus. 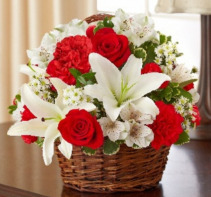 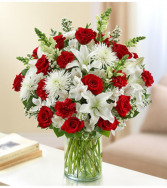 Convey your caring wishes during times of loss with our graceful red and white sympathy bouquet. Lovely roses, stock, lilies, mums and carnations are hand-crafted in a lovely glass vase to express your heartfelt memories of loved ones who have passed on. 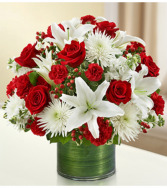 Graceful red and white floral arrangement of roses, stock, lilies, spider mums, carnations, hypericum and mini carnations, gathered with variegated pittosporum and salal. 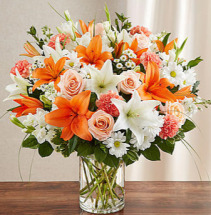 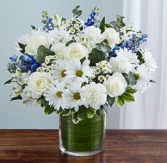 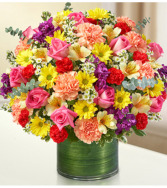 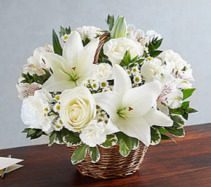 Remember a loved one who has passed on with a stunning tribute arrangement. 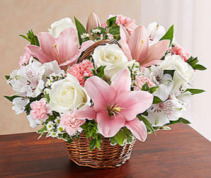 The elegance of pastel-colored roses, lilies, gladiolas, stock, snapdragons and more offers your heartfelt memories of a beautiful life. 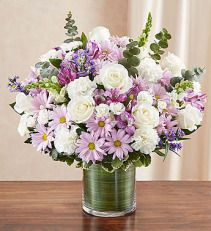 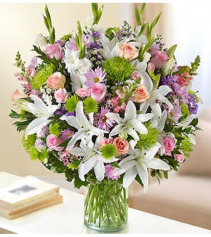 Lush, pastel-toned arrangement of roses, lilies, gladiolas, stock, spider mums, poms, snapdragons, mini carnations, daisy poms, monte casino and waxflower, accented with variegated pittosporum, salal and myrtle. 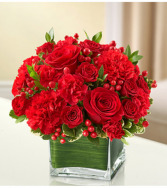 Express your condolences perfectly with the elegant beauty of our abundant all-red arrangement, a traditional symbol of courage and strength. Lovely roses, Gerbera daisies, alstroemeria and carnations are hand-designed by our florists in a classic vase for a sincere offering of your sympathy. 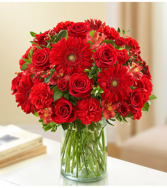 Lush bouquet of the freshest red roses, spray roses, Gerbera daisies, alstroemeria, carnations, mini carnations and hypericum, accented with variegated pittosporum, salal and myrtle. Express a memorable tribute during times of sorrow with our lush red and white vase arrangement. 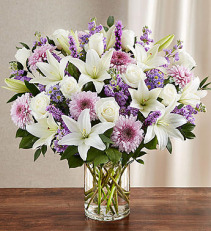 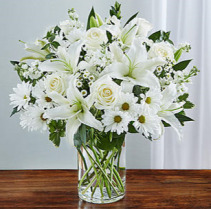 Roses, lilies, snapdragons, spider mums, carnations and alstroemeria send a message of your deepest sympathy to friends and family members, beautifully arranged by our expert florists. 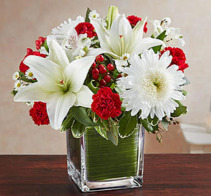 Lush red and white arrangement of roses, lilies, snapdragons, spider mums, carnations, alstroemeria and monte casino, accented with variegated pittosporum, salal, seeded eucalyptus and myrtle. 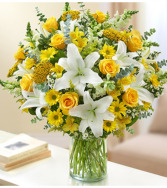 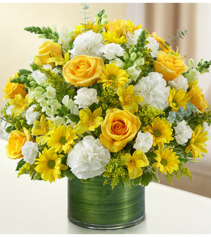 An elegant expression of your care and concern, our abundant arrangement of roses, lilies, snapdragons, yarrow, alstroemeria and more in bright and beautiful yellow and white offers a comforting tribute during times of sorrow. Lush yellow and white arrangement of roses, lilies, snapdragons, yarrow, alstroemeria, daisy poms, solidago and monte casino, accented with variegated pittosporum, spiral eucalyptus and salal. 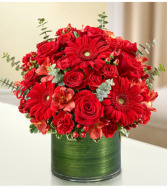 The symbol of courage and strength, an all-red bouquet conveys your sympathies with striking beauty. 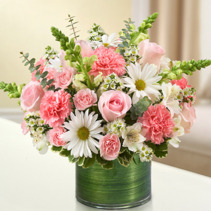 Our florists fill a stylish cube vase with roses, spray roses, Gerberas, carnations and more to send a fitting tribute during times of sorrow. Elegant arrangement of red roses, spray roses, Gerbera daisies, carnations, mini carnations and hypericum, accented with variegated pittosporum and myrtle.